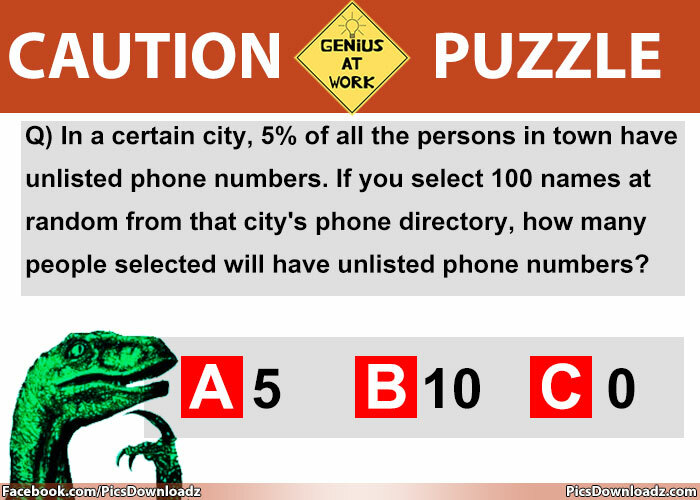 95% of people answer this puzzle wrong. To solve this puzzle, you have to think logically, read the question carefully and find the logic. Let see if you answer it correctly. Comment your answer before confirm it! # In a certain city, 5% of all the persons in town have unlisted phone numbers. If you select 100 names at random from that city’s phone directory, how many people selected will have unlisted phone numbers? None. If their names are in the phone directory, they do not have unlisted phone numbers! So, you get the answer? Let’s find out, if your friends can solve this puzzle or not. And yes, don’t forget to share and like. Thanks!